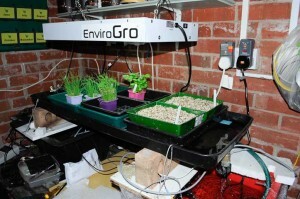 As we have recently moved into a new house I thought I should take a little time and investigate what would be involved in implementing a system which I could use for monitoring and automating parts of our new greenhouse as well as around our home. If you have had a look at my previous automation page you can see that I have already played with some one wire electronic equipment and a little bit of X10, I wanted to make a larger system now though which I could keep on expanding as I wanted. Looking at the available options for automating lights and music etc. around the home I found them to be quite expensive and not flexible enough for what I wanted to do, So I was going to have to design all the parts I wanted from scratch. 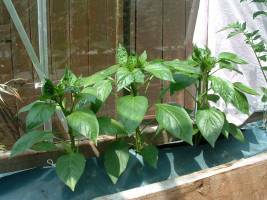 As my previous experiments with one wire items had worked well and these items are very low cost and reliable I decided I would still use dallas one wire equipment for monitoring things like the levels in my greenhouse tanks and temperatures etc. One wire items work by interfacing to a PC or other computer via one cable, In my case I used Cat5 ethernet cable because it is low cost and contains spare cores for future use. The first think I needed to do though was purchase a new interface to allow my PC to talk to the one wire items over a long distance. So I purchased a Link12 interface from iButtonLink, You can see this item in the photo. 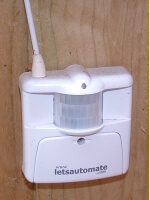 This has now been working very reliably for over a year and goes along way around the house and garden. The interface plugs into the PC via a serial port. I decided to do away with a lot of the X10 equipment I had been using due to a lack of speed for turning lights on and off and also I have found it to be unreliable. Sometimes a code was missed until sent again etc. One of the problems with basic X10 is that there is no confirmation signals sent back to the transmitting units, So when this is interfaced with a PC the pc doesn’t really know if when it asks a light to turn on that it actually has. New versions of X10 have been developed to accomodate this but in the UK these are not readily available. I do like the Radio versions of X10 though rather than the X10 which uses mains supplies for it signals. 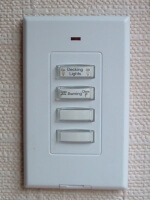 I already owned several Eagle eye motion detection modules and stick on light switches so I decided to purchase an enhanced X10 receiver which could interface to my PC and receive signals from light switches and motion detectors around the garden etc. The receiver I purchased was called W800RF and was made by wgldesigns, This was ideal because it comes with antenna which was seperate from the unit and allowed me to install the antenna in the loft to get the best all round reception of X10 Radio signals.